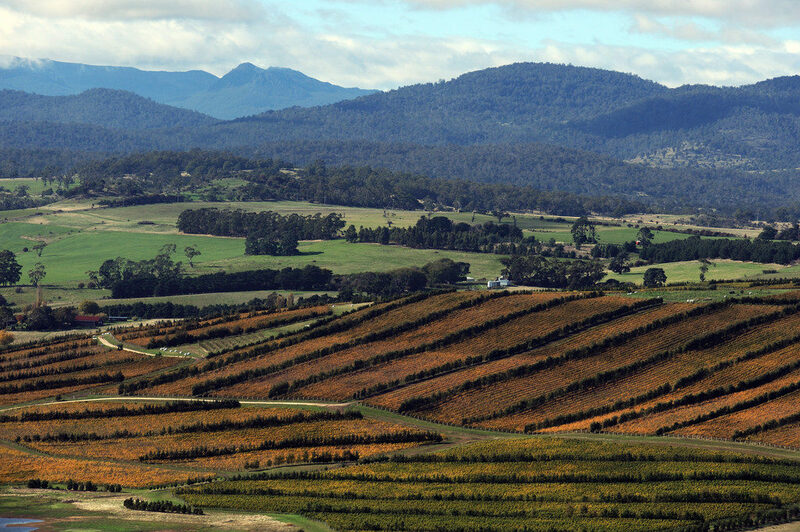 Known for its rugged beauty, stunning scenery and tasty produce, Tasmania is a feast for the senses. 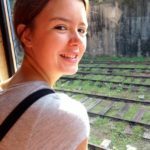 Everywhere you go you’ll find something to amaze you, from gorgeous beaches and unique wildlife to World Heritage mountain areas and historical centres. Oh – and don’t forget the fresh fruit and produce you’ll find at every stop! Tassie is the ideal place to come if you want to escape the mainland and delve into the wilderness for a while. It’s the perfect island retreat, minus the palm trees but with all of the charm. Tasmania has airports in Hobart, Launceston, Devonport and Burnie. You can fly to these from most cities in Australia with Jetstar, Tiger, Qantas and Virgin. From Melbourne, you can fly to Burnie with Regional Express (REX) Airlines. 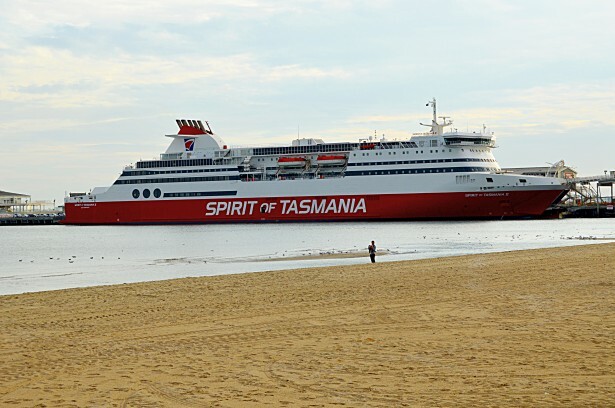 If you want to take a car across to Tasmania, the Spirit of Tasmania Ferry is your best option. You can choose from a day or night crossing. A day crossing will take approximately 9.5 hours. You don’t need an allocated seat for this crossing and you’re free to wander the boat as you please. A night crossing takes approximately 11 hours and you’ll need to book a recliner or cabin to sleep in. Northern Tasmania is home to some gorgeous small towns, some of which sit right on the water’s edge. They all have their own quirky, relaxed charm, and plenty of character. 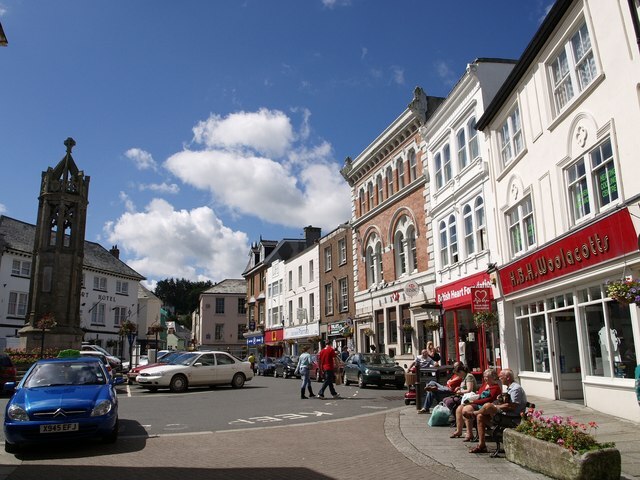 The largest city in the north is Launceston, which is bursting with old style charm and natural scenery. Heading west there are great coastal drives, particularly from Devonport along to Stanley. Make sure you stop at Table Cape near Wynyard along the way. 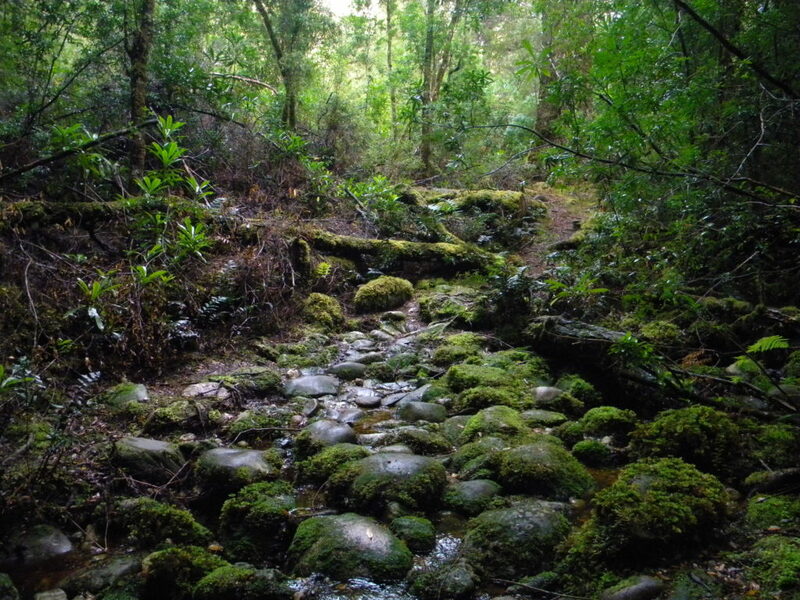 Also situated in the west is Cradle Mountain, which is also worth a visit. 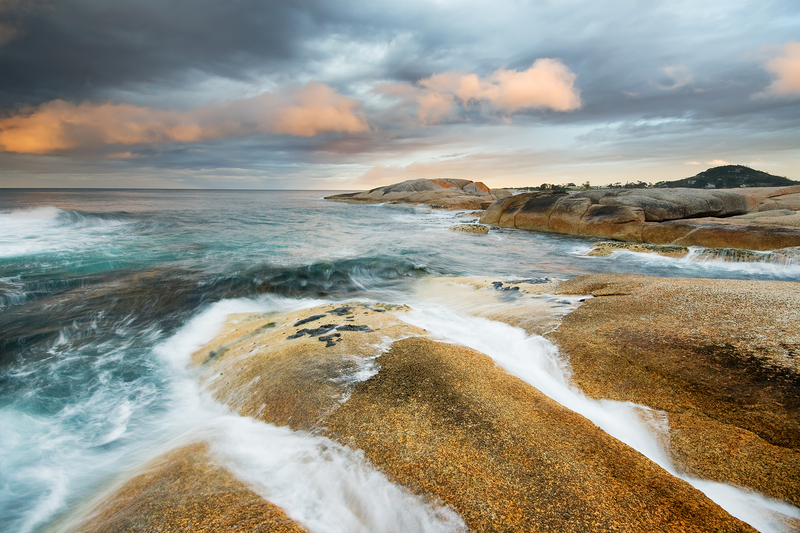 East Tas is the place to go for spectacular beaches and landscapes. There are five national parks spread along the coast so you know it’s going to be gorgeous. 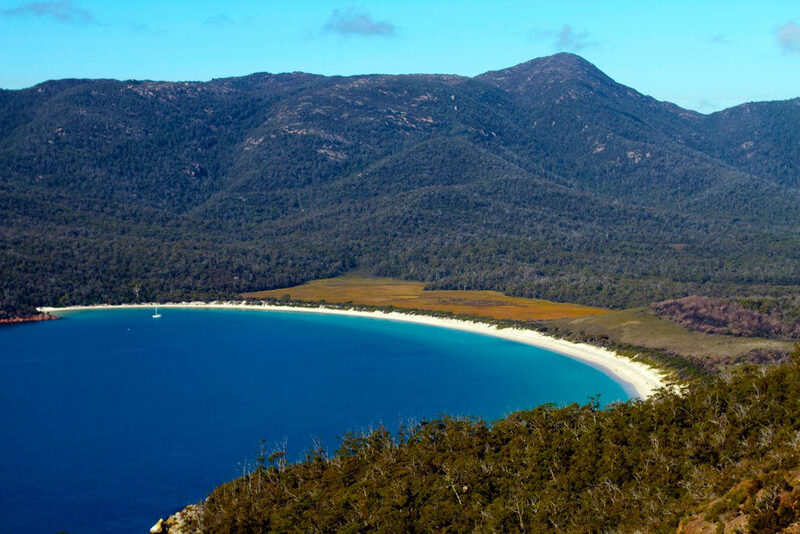 Freycinet National Park, home to the famous Wineglass Bay is a must. 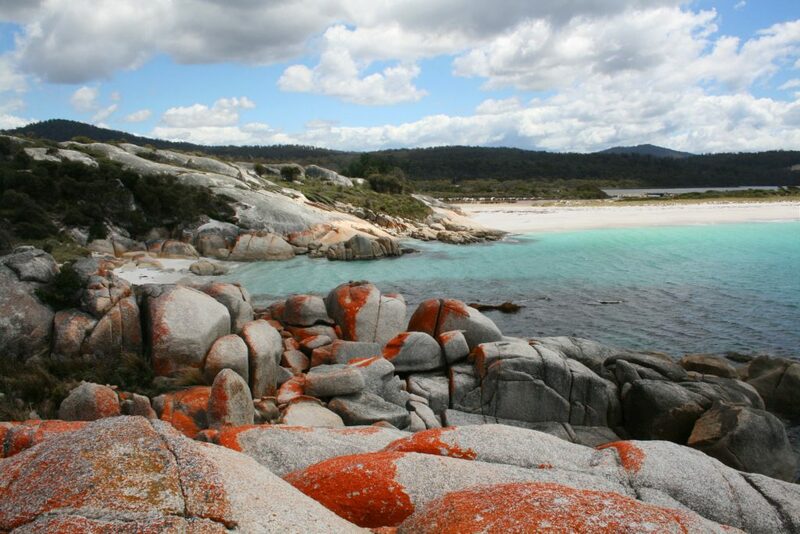 And of course, you can’t miss the Bay of Fires. If you’re after some seafood, the largest towns on the coast Bicheno and St Helens will keep you happy. They’re both busy fishing ports that are a great place to stop for a night or two. Hobart, Port Arthur and Bruny Island are the obvious highlights of the South, but there are even more gems to discover if you’re prepared to explore. Quaint Huonville and Cygnet are great spots to visit for fresh produce and tranquillity. Welcome to the wild West. 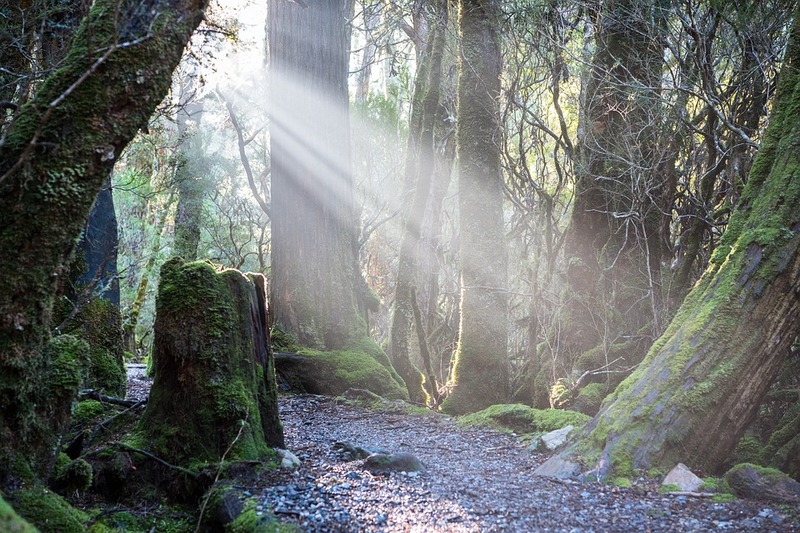 Here you’ll find Tasmania’s Wilderness World Heritage Area, a spot that is rugged and remote as they come. While exploring this part of Tassie isn’t as ‘easy’ as the rest, you’ll be well rewarded if you persevere. Magnificent lakes, rivers, rainforests and giant sand dunes are just some of the beauties waiting to be discovered. 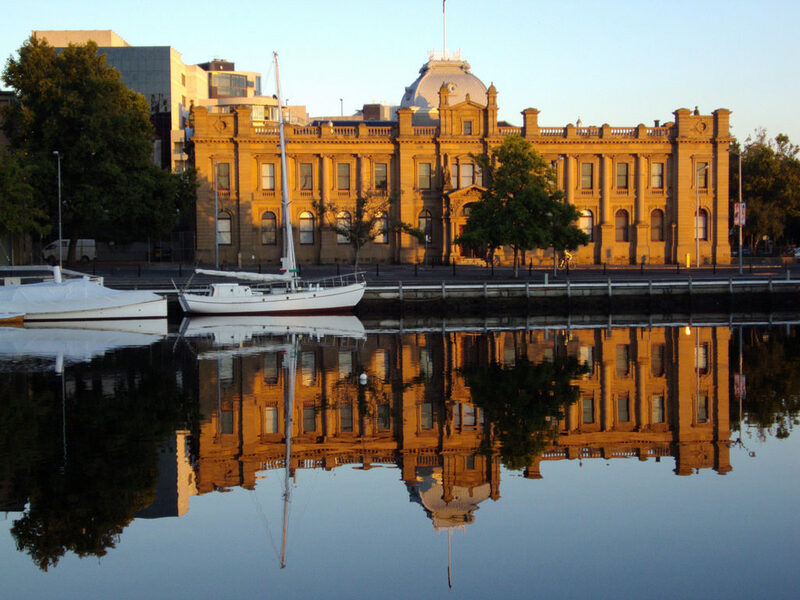 Tassie’s two largest cities have forever been locked in a battle for ‘the best’. Given that both offer incredible scenery, welcoming cafes and bars and some great activities, it’s pretty hard to choose between the two! Here are a few highlights to see in each. The old sandstone warehouses of Salamanca Place set down by the water are a great place for a weekend stroll. There’s a bustling market every Saturday, where you’ll find everything from organic produce and homemade cheese to hand-blown glass and knitting. Since opening in 2011, MONA’s definitely had a hand in Hobart’s increased popularity. It’s Australia’s largest privately owned art museum and has a seriously impressive collection. The whole place is full of character, and whether you get there by ferry up the River Derwent (try the Posh Pit) or drive there, you’ll be overwhelmed as soon as you arrive. Almost 1300 metres above the city, Mount Wellington has plenty of great views. There are tons of walks to choose from here, and even a coffee caravan halfway up the mountain! 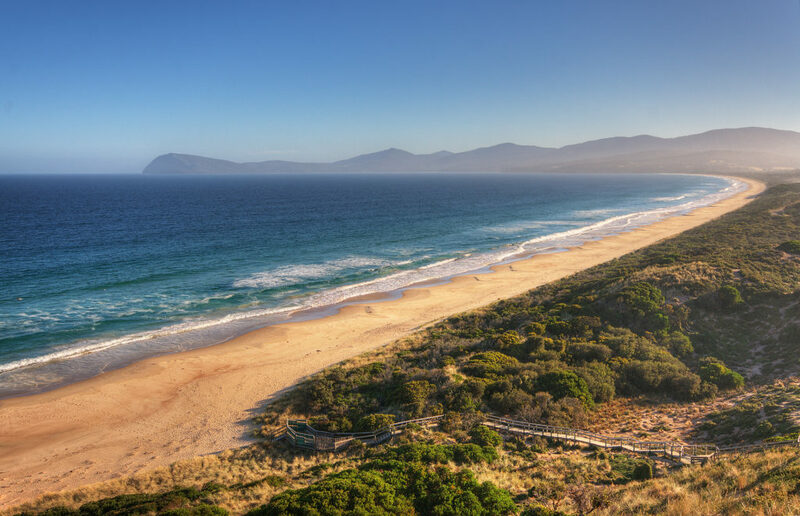 So it’s not technically in Hobart, but Bruny Island is such an easy day trip from the city that it just can’t be missed. The island is famed for its produce – oysters, cheese, gin and beer – as well as its beautifully preserved nature and scenery. There are lighthouse walks, epic coastal lookouts and even some wildlife spotting to be had. Riverside city Launceston is packed with century-old parks, beautiful scenery and rolling hills. There’s an old-world feeling to this city, and something deeply charming about its elegant Colonial and Victorian architecture. A slice of wilderness just 15 minutes from the city centre, this is the spot to come for a break. Boasting plenty of walking trails, beautiful gardens and wildlife, as well as the world’s longest single span chairlift, you can easily spend a day exploring here. Located in the centre of the city, City Park is just one of many in Launceston. Perhaps what makes it most special is the snow monkey enclosure – full of Japanese Macaques, gifted to Launceston by sister city Ikeda City in Japan. The Tamar Valley extends north from Launceston to Bass Straight. The route is lined with vineyards, cellar doors, picturesque scenery and historic buildings and makes a great day trip. 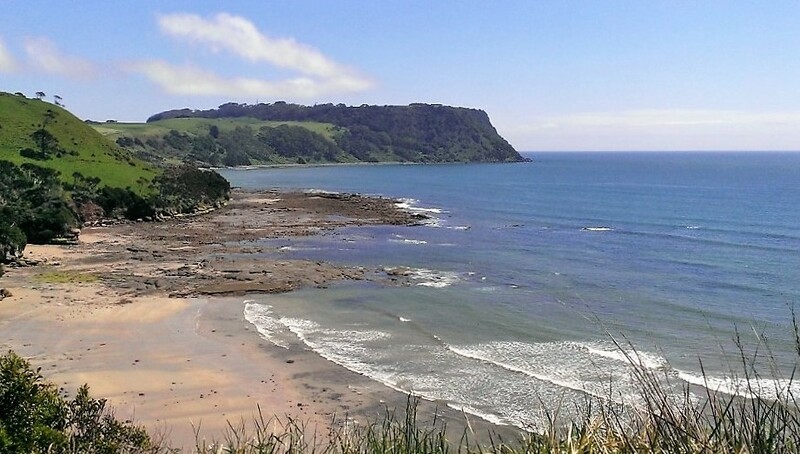 The summer months – December, January and February – are peak season in Tasmania. Tassie can get pretty cold in winter, so if you’re after a bit of sun, plan a trip at the start of the year. Autumn and winter are great times to grab cheap airfares and discounts on deals however and there’s the Dark Mofo festival in Hobart to enjoy. Running throughout June, it’s a winter festival that’s full of fire, food and art. So, are you tempted by Tassie? We’ve got some great one day and multi-day tours that will make your trip even easier! Check them out here. Which Australian City Should You Travel To?